Groups are a great way to sort your subscribers based on common interests or preferences. To send targeted content to groups, you'll create a segment based on group data in your list. You can do this directly from the Campaign Builder, or create a reusable segment in the Lists section of your account. In this article, you'll learn how to send to groups in your list. You need to have a list with at least one group with people in it. Make sure you're familiar with groups and segments. 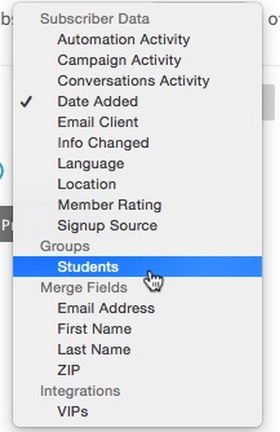 Groups are stored as data fields in your list, just like other data you use to create segments. To target groups with an automation, edit the segment for the email in that automation. To learn how to edit a segment in an automation email, read Edit Automation Emails. This process segments groups with a single condition. To further target recipients, use additional segmentation conditions. To send to groups from the Campaign Builder, follow these steps. In the List drop-down menu, choose the list you want to work with. 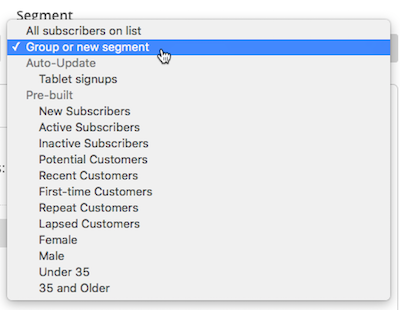 In the Segment drop-down, choose Group or new segment. Click the first drop-down menu and choose a group category. Click the second drop-down menu and choose whether to send to subscribers who are in one of, all of, or none of the group names. Click the group name you want to send to. Click and hold CMD or CTRL to select more than one group name. Click Update Recipient Count to see how many subscribers are included. You're all set! Now, only the subscribers who meet the conditions you set will receive your campaign. Click the recipient count to view each of them. You can also create reusable, saved segments based on group data in the Lists section of your account. To do this, create a segment with the conditions set to the group or groups you want to target. Save your segment to reuse it as many times as you need.